Rick Remender’s storytelling this month is much more in line with a western than a space-faring adventure. But while his cast may be wielding more six shooters than lasers, they’ve retained their depth and appeal. Remender doesn’t allow the story to take itself too seriously, though a scene near the end of the issue comes close, and still manages to sneak a sudden fight scene into the middle of what’s otherwise a fairly low key, character-driven episode. Though the writer keeps the cast very small, almost surprisingly so, the story never seems to want for more faces. Like a good film, Fear Agent would rather focus on a handful of developed, recognizable individuals than an armload of also-rans. The plot keeps a steady pace from cover to cover, sets the pieces in place for a future throw-down and delivers on an ambitious range of emotions. My only complaint is that it wasn’t longer. If you’re familiar with Tony Moore’s work on The Exterminators or The Walking Dead, his contributions to Fear Agent won’t come as much of a surprise. Moore’s quick, concise lines and texture-rich visuals lend the book a flippant personality that fits nicely with the tone of the storytelling. Whenever I’ve had the pleasure of taking it in, Tony’s been having so much fun with his work that it quickly becomes infectious. His unconventional renditions of alien creatures are a case in point - refreshingly far from the beaten path, they’re one of the book’s greatest strengths. The evil alien mastermind in this issue doesn’t even have a face! While the writing may ask its readers to turn off their brains and just enjoy the ride, the artwork outright demands it. 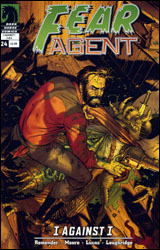 Although Fear Agent sets the stage for its adventures by claiming it’s just a joyride, this week’s product shows signs of being much more than that. It’s still going through some growing pains, and not every shift of emotions is a successful one, but the basics are strong and the changes haven’t come at the expense of the book’s identity. This is a series that’s more than willing to take risks with its cast if it makes for an improved story, while still managing to keep hold of its patented sense of humor and eye for wild action. I enjoyed it, and while I don’t think it’s maximizing its potential this month, it’s still worth experiencing. Borrow it from a friend.